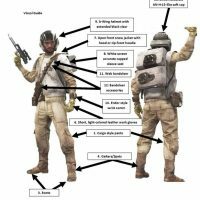 Desert Trooper from the Star Wars Battlefront computer game. Accurate light tan/light khaki colored commercial BDU in rip stop or twill is acceptable. There should be two pockets in the back. Long or short sleeve white t-shirt. NOTE: OPTIONAL FOR FEMALES – If using the optional white hooded jacket, you would use a light tan t-shirt. “Desert” style combat or hiking boots with lug soles and rubberized toe in a light tan/khaki color. – Zahal or Palladium (Israeli style) commando boots are preferred, and commercially available at this time Tan combat boots are authorized for people with size 13 or larger sized boots who cannot get the “Zahal,” Palladium or similar style boots in their size. Combat boots/work boots must have the rubberized toe and should have any side panels or details covered by the gaiter. Medium tan/khaki cloth or canvas spats/gaiters. If lighter color is used, they can be heavily weathered for a darker appearance. Gaiters must have a singular vertical seam in the back. The gaiter is a tube of heavy cotton or natural fabric starting from the bridge of the foot, angling down on both sides in a curving arc and ending just above the heel in the back. The gaiter should cover most of the boot laces, continuing up past the boot top, to slightly below mid-calf. NOTE: OPTIONAL FOR FEMALES: Gaiters can be white with a eyelets and laces up the back. Belt should be canvas strapping style in a dark khaki or olive color about 2″ wide. Belt must have a black, square, open faced buckle. Strapping must match the strapping of the bandolier. Gloves should be a light tan color. Weathering can be added to give the gloves a slight “yellow” color. Suede is not acceptable. Preferred is ball and strap design glove. Must be a smooth leather in a very light color. Hooded layer must be screen accurate light tan in color. Commercial hooded sweatshirts are allowed but the zipper must be removed and only single seam hoods are allowed. There are some commercial “hoodies” that have a double seam on the hood-those double seamed hoodies are not allowed. NOTE: OPTIONAL FOR FEMALES: Hooded jacket can be white. Capped sleeved vest is similar to Endor Commando vest. Vest must have slash pockets and a padded angular, quilted applique on the right upper chest that starts higher near the arm pit and extends lower to the front closure of the vest. No closure needed on the vest. Weathering is recommended to bring down the brightness of the white fabric. Capped sleeves must have adequate structure to hold their shape. Double thickness of fabric with a heavy stabilizer recommended. Sleeves should also be rounded and not have a “pointy” appearance. Screen accurate white/very light gray colored A-Wing style helmet with an extended, custom black visor. Helmet should have padded, dark leather (or leather substitute) interior edging about as thick as the plastic part of the helmet. Note that the hard helmet must be proportional and not over sized or undersized. The soft cap must be light gray to medium gray in color. Cap must have a ribbed panel that goes across the top down the center of the cap but the smooth sides of the base layer cap must be seen on both sides of the ribbed panel. Bandolier should be made from a medium brown or dark olive strapping material and should match the color of the belt. Bandolier strapping should be about 2″ wide and have loops for greeblies sewn into the strap starting just below the shoulder to about mid chest. 5 loops are recommended. The loops should have 3 lines of stitching running along the straps to distinguish the loops from the backing straps. You can leave the loops empty, or add greeblies as described in the optional items list..
Square Endor style chest greeblie worn on left side of capped sleeved vest. Greeblie is bronze in color. You must also choose 5 items from list below for approval. 1) Side cargo pockets on the BDU pants. The side cargo pockets can be added by using a second pair of the pants to cut the fabric from. The side cargo pockets should extend from just above the knee to above the gaiter. 2) Custom panels on pant front: The pants should have two panels (also cut from same fabric as base pants) that go from the waist and extend in length down to the mid thigh. The panel should go from the outside seam of the pants across the front to about mid thigh measuring from the side seam to the fly front zipper panel. 8) Backpack: For females: Canvas military-style backpack -no nylon packs. – Screen accurate is two pocket pack. – Needs hose accessory shown in the game. For males: Hoth/Endor hardpack in white fabric with grey shoulder straps. Additional notes: Males can make the female version of this costume and females can make the male version but there is no mix and match. Also: alien masks with heads that do not allow for the headgear can be judged without it.